My girls are not fans of pizza crust—and also, generally prefer vegetable toppings to meat toppings on pizza. They love to use tortilla wraps as the crusts for quick, lunch sized pizzas—and I love that I can sub in whole grain tortilla wraps to an already, low-fat crust to make it even healthier for them. Meatless Monday doesn’t have to be just for the grown-ups! With this “cooking with kids” recipe idea, the kids will gladly go meatless for a yummy, personal-sized, veggie loaded, tortilla pizza! 2 Tbsp. Marinara Sauce or Pizza Sauce Chopped Vegetables: I offer up an assortment: sliced olives, diced onion, tomato, peppers, mushrooms, zucchini, broccoli---I set up ingredients in individual bowls and let the girls pick and choose their toppings. Instructions for Meatless Monday Veggie Tortilla Pizza. Prepare oven and baking sheet. Preheat oven to 400 F. Line a cookie sheet with a strip of aluminum foil and spray with olive oil flavored cooking spray. 2 Burrito sized tortilla wraps will fit on a standard cookie sheet. Add the sauce to the “crusts”. Place the tortilla wraps on the prepare cookie sheets and top with 2 Tbsp. of Marinara or Pizza Sauce per wrap. I spoon the sauce onto the wraps and let the kiddo spread it out with the backs of spoons. Set up a pizza building station. Kids are “grab and go” creatures. I set up a bunch of individual bowls with all of the available ingredients—even the shredded cheese--and let them just go at the pizza topping accomplishment. Expect them to snack a bit as you top the pizzas—so they may actually eat MORE veggies with this lunch than usual! The toppings will not cook thoroughly as the “pizzas” bake—so if the kiddoes prefer soft veggies, you may want to pre-cook them a bit before offering them for pizza building. Top the Tortilla Pizzas. 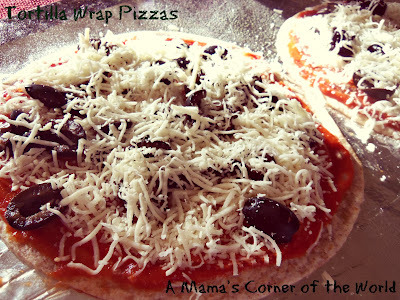 Let the kids spread the sauce and sprinkle toppings onto the tortilla pizza crusts. The crust won’t support as many toppings as thicker crusts—so a kid-sized sprinkle of each and about an-eyeballed 1/3 c. of shredded cheese may be the goal. 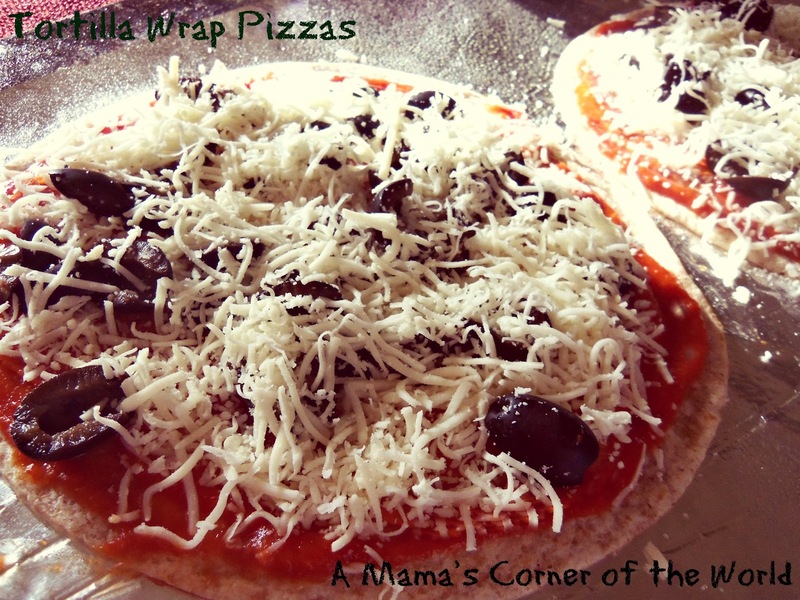 Bake the tortilla wrap pizzas. Bake the pizzas about seven minutes or until cheese is thoroughly melted. Serve. We serve with a salad and fruit—and the girls are always happy with these since they control the toppings. It’s a quick and easy, Meatless Monday lunch that the kids both love to make and eat! I have to try these for my kids!